Sonex Aircraft is pleased to announce the availability of three new features for the SubSonex Personal Jet! All three new kit features are included under current SubSonex pricing, and upgrade kits are available to existing customers. The SubSonex now features electric flaps. The electric flap system is compact and lightweight. 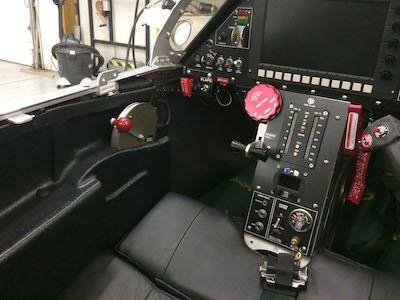 Additionally, the manual flap lever on the left-hand cockpit wall is eliminated, allowing the PBS TJ-100 engine’s throttle quadrant to be relocated to a more comfortable position in the cockpit.The 24 Volt electric flap actuator includes a potentiometer, allowing flap position to be indicated by your EFIS avionics system. 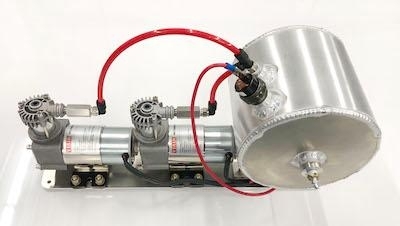 The SubSonex Dual-Pump Air System for pneumatic landing gear actuation is now the standard for all new SubSonex kits. The system includes a lighter-weight aluminum air tank vs. the original SubSonex steel tanks. Lightweight dual air pumps provide a faster charge time and a redundant system. The 24 Volt pumps eliminate the need for a 12 Volt DC to DC converter in the aircraft as all remaining aircraft systems can run on 24 Volts. The Dual Pump Air System package bolts directly to the SubSonex main wing spar and includes a downward-facing drain plug for easy access through a belly skin access hole. SubSonex Main Gear Up-Locks prevent “sagging” (partial deployment) of the gear during aerobatic positive G-loads. The system is automatic and the operating procedures in the cockpit are unchanged. SubSonex Up-Locks have been in-use in Sonex factory prototype aircraft with frequent air show performances, exhibition and test flight operations since mid-2018. Up-Lock parts are now entering production, and are estimated to ship by the 2nd quarter of 2019. All new SubSonex Personal Jet orders under current pricing will include Up-Locks, and Upgrade Kits are available to existing customers. Orders are now being accepted.